Cooking Mama Let’s Cook is a new game from Office Create for Android and iOS devices, and as you may have guessed, it’s a cooking game. 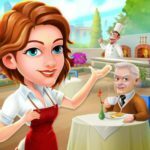 You play the role of Mama, who prepares new recipes for customers “with a chop chop, a bubble bubble, and sizzle sizzle.” Features include a number of mini-games with “simple, intuitive touch controls,” and the ability to combine different kinds of recipes. And once you’re done, you can serve your dishes to Papa, who will be “more delighted” as you improve your cooking. He’ll also have some daily requests for you, and will reward you with “fun gifts” if you fulfill them successfully. 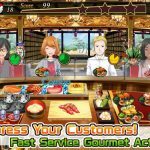 It’s definitely not your average cooking game, although you’re still serving customers like you would in others that are set in restaurants or diners. Want to make Mama the best chef/cook out there while fulfilling those requests and opening more restaurants? We advise you to read on and check out our detailed Cooking Mama Let’s Cook strategy guide for more information. It comes with all the tips you need for this game, which should be most useful if you’re a beginner, but also a good resource if you’re more experienced in this game but have been having some difficulty in certain areas. Before we get down to the nitty-gritty of things, let’s start with the basics. If you see that there are two pieces or more of the same food (Foo-Don) adjacent to each other, all you have to do is to hold down on one of the pieces so you can merge all of the adjacent foods into a substantially larger piece. This merged food item can be merged with other types of food, including food that has already been merged; it may sound a bit confusing, but you can do all that in this game as you create bigger food combinations. Tap on the food combination when it’s large enough and you can cook it, then serve it to your customers. You will earn points for each customer you’re able to serve. Once you’ve combined food, you’ll see a number over the piece, and bigger numbers means more points. Essentially, you’re stringing together, and clearing combos with the mechanic we explained in the above tip. You should clear all of the combos present before the round is over, because if you don’t, your efforts will go to waste as you earn zero points, regardless of how big your combination was. And, just to stress for the first time a fact that we’ll mention quite often in this guide, it will often be a high-pressure race against time for you in this game. Once you’ve cleared out all of the big combinations, you’ll see several smaller combinations, which you should then clear as quickly as possible. Keep on clearing the smaller combos as the round progresses, so you can earn a ton of points in the process. You can also clear the smaller combinations before the larger ones, but based on our observation, clearing the big before the small seems to work better. By going to your book’s recipe section, which is beside the Foo-Don section, you’ll see a list of the recipes you already have. Making recipes would be a key element of most of the quests in Cooking Mama, and as you complete more quests, you will also unlock more recipes, and also more shops/restaurants. Further, you can also earn coin bonuses and get extra lives. This holds especially true when you’ve just opened a new restaurant. Things can get a little complicated, as some quests would have to be completed in one sitting – these quests have the “1 Play” label beside them. That means if you aren’t able to complete a 1 Play quest the first time around, you’ll have to start from scratch and try all over again. Then again, you have quests that don’t require you to complete them in one sitting – these quests, on the other hand, have the Total label next to them. You can play them out over several games, as long as you continue playing in the same shop. You may have been wondering about this one. Foo-Don are more than just ingredients; they’re essentially your companions in this game, and are pretty much Cooking Mama’s equivalent to pets. They can be raised outside of the many mini-games in here, and they have their own skills to boast of, which we’ll discuss later. Curiously, they also look just like food, hence the “Foo-Don” name. More experience levels for the Foo-Don means larger bonuses when you use those characters to string together combos. For each Foo-Don’s identical food that is cleared, you’ll earn one experience point per Foo-Don. You can also spend a ticket to cultivate them, and earn a handsome 1,500 XP for your efforts, all in one go. 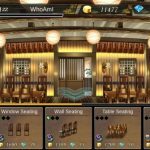 As you keep on tapping more Foo-Don to create your dishes, you’ll see that your diner satisfaction (the “Happy” meter gauges this) rise up at a faster pace. The faster the tap, the faster the meter fills up, the faster you can earn coins for filling up the Happy meter. Remember that in this game, you’re under time pressure, and lots of it. Tapping on Foo-Dons adjacent to each other and doing so quickly appears to have more of an effect in filling up the happiness meter quickly. Fast-tapping on groups of three Foo-Don also lets you cook those dishes faster, with the ingredients appearing from above at a faster pace. Not only do you get things done quicker, you also make your customers happier as a result. As Foo-Don are like ingredients that are also like “pets,” they do have “leaders” as well. You will find a leader Foo-Don meter at the bottom right hand side of your screen, and when that meter fills up, you can tap on it to activate its special skill. Leaders are chosen at random, which means you’ll need to do some reading up and find out how special skills affect your game as of the moment. Go to your book (it’s located next to the Play button) so you can see the skill benefits of each ingredient. Berry-Don (Berry) freezes your timer, which is helpful as the game could really put one under time pressure. Che-Don (Cheddar Cheese) can be activated before tapping a Foo-Don to make new dishes. 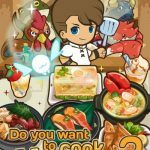 Ebi-Don (Shrimp) has the leader skill of making the game’s titular Cooking Mama make dishes in just a few seconds’ time. That means your dishes will appear almost instantaneously, and be served to customers pronto. Nick-Don (Red Meat) powers up dishes, thus making the happy meter fill up faster. Pan-Don (Bread) makes a Golden Spice show up, allowing you to instantly turn ingredients into dishes. By placing 15 of the same Foo-Don next to each other and tapping on one of them, you can create Silver Spice. Don’t tap on the Silver Spice just yet when you first see it on the vessel. The spice may float on top of other Foo-Don, but hold your horses – let it settle down and mellow before taking any further action. The spice will then mix with the different ingredients, and once it’s all settled, you can tap on it to turn any surrounding ingredients into food. You should remember that creating Silver Spice is no joke. You may have to go through tons of ingredients and take quite a while to gather a whopping 15 Foo-Don of the same type; that’s not really a wise thing to focus on when you’re under the clock. But if you see a chance for a huge combo and see too many of the same ingredient type in one vessel, you may give it a little time and wait for new ingredients to show up. 10. Which Power-Ups Should You Buy? The game has a total of six power-ups, and to be honest, all of them can help you in their own way. None of the power-ups can be truly considered as useless or overrated, but if there are a couple that are better than the others, we’d have to go with the Timer power-up, which costs 4,000 coins and helps you deal with the demanding pace of the game by giving you ten bonus seconds on your timer. The Foo-Don Reduced power-up costs a bit more at 5,600 coins, and is also quite useful, as it ensures that your vessel only includes four Foo-Don types. That makes the matching process much faster, with less Foo-Don types to deal with, and less thinking to be done as the timer ticks away.